His name is Pond, James Pond and he's just as suave and debonair as another super spy that goes by a similar name. Well, maybe not quite as suave and debonair, but pretty darn close considering he's a...well, whatever he is! In SUPER JAMES POND, Dr. Maybe second cousin once-removed of Dr. No continues his plans to take over the world by planting bombs disguised as penguins in toy factories all over the North Pole. It's up to you, as James Pond, to head north and thwart the doctor's evil plans. You've got nine massive levels ahead of you, each chocked full of enemies, obstacles, and bonus areas waiting to be discovered. 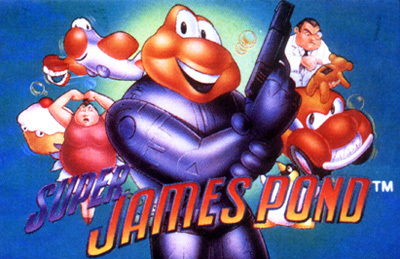 Jump into SUPER JAMES POND and save the world from the diabolical Dr. Maybe.